Does a repair, rebinding or restoration affect the value of rare, valuable or historical books or Bibles? 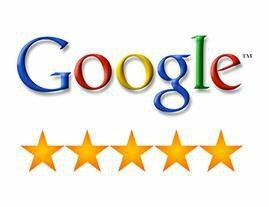 At Bella Becho we have many happy customers and we want to keep it that way. 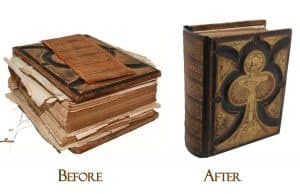 Our slogan is "we turn functional to fabulous" so our bookbinding business is to transform old damaged, torn and unusable books and Bibles into beautiful and functional books and Bibles to be enjoyed. We have performed thousands of book repairs, bible rebinding, and restorations. Our customers give us glowing Testimonials. 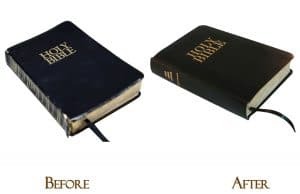 Customers see that our repair and restoration services increase the functionality of the books and Bibles so they can be treasured by future generations. (Photo at right) The Gutenberg Bible: Printed in 1440, is the first book to have ever been printed on a printing press. There are few copies left, and in 2007 a single leaf of one went on sale for over $70,000. Do you have a rare or historical book? What are some examples of rare, historical or "valuable" books? Shakespeare’s First Folio: Rare because it is the first authoritative collection of his plays, compiled by his friends and business partners who helped run his theatre company. An estimated 750 copies were printed between 1622 and 1623. Don Quixote: First editions of this and other works can sometimes have higher market value. The Tales of Beedle the Bard: Sometimes it is not old books that are valuable, but new ones. In the final Harry Potter book, Albus Dumbledore bequeaths Hermione with the first edition of The Tales of Beedle the Bard, a book about wizarding bedtime stories and folklore that lead to the discovery of the Deathly Hallows. The fictional book became such a hit that J.K. Rowling illustrated and published 7 handmade copies, decked out in leather and silver jewels, which granted them the name the Moonstone Edition. She gave 6 to the people who helped her make the Harry Potter series so successful and sold the last to benefit the Children’s Voice charity. Mark Twain’s The Adventures of Huckleberry Finn: This book had over seven documented (and corrected) mistakes during the printing process. When certain books are evaluated, the number of “mistakes” that occur in the printing process could elevate their value. Is the book adorned with gold leaf? A beautifully leather-bound book with gold leaf on the cover could make it valuable. We use gold foil and not gold leaf on new replacement covers. If you are interested in keeping a gold leafed cover, there may situations where we could try to save all or a part of the existing cover by embedding it into a new cover. Its an option so let us know. 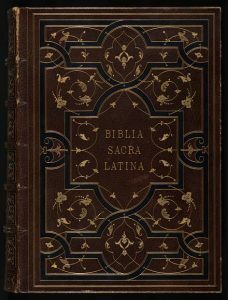 Obviously there are numerous other examples of rare or historical books that may have substantial market value. If you are unsure whether you have a rare, valuable or historical book, you should first consult with an antique book appraiser or a rare collections department at your nearest university library. They should be able to tell you the market value and advise you of other important facts surrounding your book. 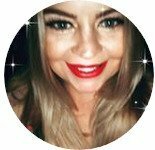 We do not appraise or determine whether or not your book's market value would be affected by any work performed on it by Bella Becho. Our work on the book could affect the market value in the book collecting world. Your experts should be able to advise you of the potential effect on the book's market value if we perform any work on it. A book appraiser should also know the types of repairs that should and should not be performed on your book. They should also know and advise you as to whether or not the proposed repairs, rebinding or restoration work we may do should be performed at all offer other advice. For us, these are very rare situations, but we want you to understand that the very act of working on a rare or historical book could cause a significant decrease of the market value of the book or Bible. For books or Bibles with significant monetary value, it may be best not to undertake any repairs or restoration if a customer's goal is to preserve the monetary value. The final decision whether you want Bella Becho to perform repairs or restoration is up to you. If you believe you have a rare or historical book and want bookbinding services, please be sure to first discuss this with Deborah before shipping. We would be happy to speak with any hired expert you have to make sure we are all on the "same page" so to speak. Communication is important. So before sending any rare or historical book with any "market value" other than sentimental value, please let us know. There may be certain shipping and other considerations that need to be discussed.